Eight to ten teams of the Delhi Police comprising over a hundred police officers have been constituted and are conducting raids across Delhi, Haryana and NCR to nab the other accused. Six men barge into Corporation Bank, shoot cashier dead. A day after six assailants opened fire at the Corporation Bank in Khair village and shot dead one cashier, police said they have arrested two persons in connection with the crime. Police said they found an abandoned bike and traced the number plate to the main accused, who has 10 criminal cases against him, adding they are on the lookout for him. Police said they have also recovered one TVS Apache used in the commission of the crime, a weapon used by the accused and some cash. The two accused — Sachin (20) and Parvesh (19) — are residents of Sonipat in Harayana, police said. During questioning, the accused said they had consumed a narcotic substance before the robbery. When they spotted cashier Santosh Kumar, they tried to intimidate him. But one of the gunmen panicked and shot him in the chest, police said. Eight to ten teams of the Delhi Police comprising over a hundred police officers have been constituted and are conducting raids across Delhi, Haryana and NCR to nab the other accused. 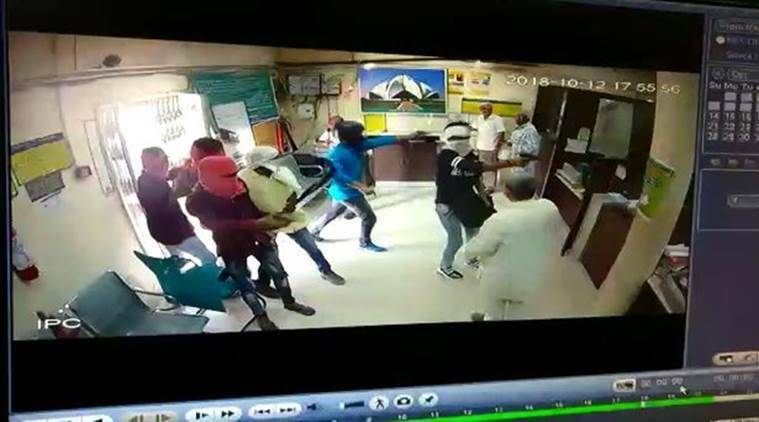 Deputy Commissioner of Police (Dwarka) Anto Alphonse said the CCTV cameras located in around 20-25 villages helped them “map the route that the accused took” following the robbery. “We have got the number plates of their motorcycle… the men later took off their masks and were identified by our local informers,” said Alphonse. Police added they are yet to trace the firearm which was snatched from the security guard. “The two accused said that the main accused, who was recently released from jail, sourced the weapons and bikes. Once he is arrested, we will cross question them,” the officer said.